Minerals in the ancient rocks on Mars record environmental conditions in which they formed, and the stratigraphy (i.e., sequence) of these minerals reveals how environments evolved over time. We generate mineral maps from CRISM orbital spectra and combine these with HiRISE images and topography to infer mineral stratigraphy. In the layered rocks at Mawrth Vallis, we thus inferred that Al-rich clay minerals formed relatively late after Fe/Mg-rich clays, a pattern subsequently mapped elsewhere on Mars that may reflect ancient surface weathering. We also found deeper layers containing the Ca-sulfate bassanite. Mawrth Vallis was one of the final four candidate landing sites for the Curiosity rover launched in late 2011. The stratigraphy of sulfates vs. clays is a key issue for understanding ancient Mars. Curiosity will explore this in Gale crater, but in the meantime Opportunity is now traversing a sulfate-to-clay transition at the rim of Endeavour crater. Our work with CRISM data in 2009 identified clays in this crater's rim hills, and polyhydrated sulfates in the brighter foreground rocks visible at left. As Opportunity acquires "ground truth" on these outcrops, our continued analysis of nearby orbital data provides additional context. Another part of our stratigraphic work involves measurement of stratal (layer) geometries. We use meter-scale digital elevation models derived from HiRISE images to fit planes to strata visible in these images. The magnitude, direction, and variability of stratal dips constrain their depositional processes and subsequent deformation. Do the sediments predate or postdate the local topography (e.g., crater or valley walls)? Were they deposited in low- or high-energy settings? Do internal unconformities suggest changing environments? These questions are answerable by our methods, which are also suitable for rover-based imagery. Geologic evidence points to a wetter Martian surface in the distant past. If liquid water was ever stable at the surface, then both the temperature and pressure there must have been higher. A formerly thicker CO2 atmosphere has been a long-hypothesized solution. But where did the bulk of the CO2 go? It might have escaped to space, but if some remains on Mars, then carbonate minerals are the largest potential reservoir. Hence the search for carbonates on Mars has long been a key thrust in the effort to understand early planetary habitability. 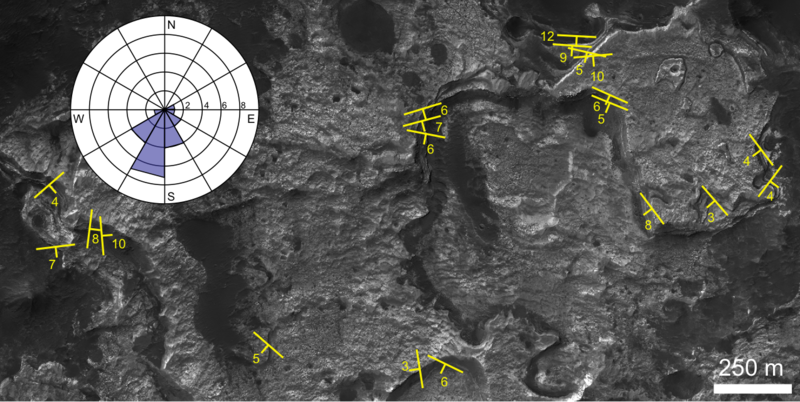 We contributed to the first identification of carbonate-bearing rocks on Mars, specifically Mg-rich carbonates dating to the Late Noachian. 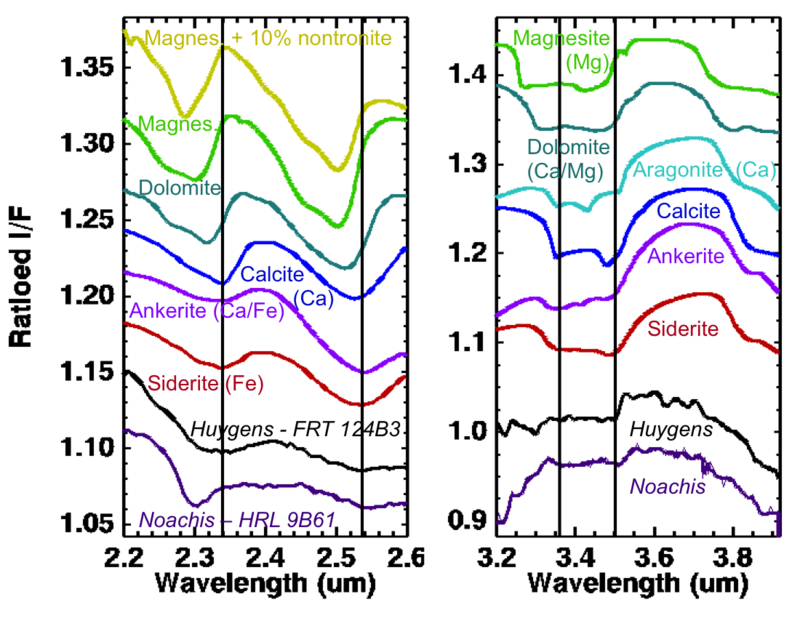 More recently, we have used CRISM to identify a spectrally distinct phase consistent with Fe- and/or Ca-rich carbonates, observed so far mainly in and around the Early Noachian Huygens basin. These Fe/Ca-carbonates may indicate a higher water activity or distinctive chemistry of the precursor rocks. One challenge to carbonate identification is the ability of smectite clays to "mask" the presence of carbonates in the 2.3 micron spectral region. Thousands of clay outcrops have been reported on Mars, but what fraction of these might also contain carbonate? To address this, we are now working with the oft-neglected 3-4 micron portion of CRISM spectra, where many laboratory carbonates have their strongest spectral features. 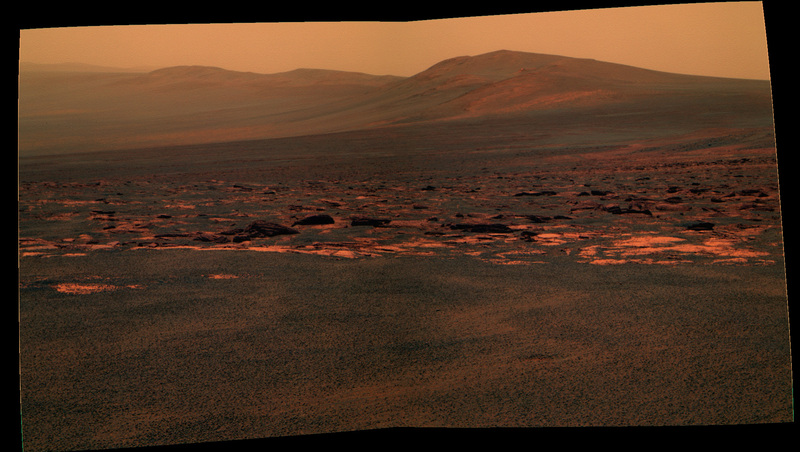 The Curiosity rover will advance these efforts through its unprecedented sensitivity to carbonates. 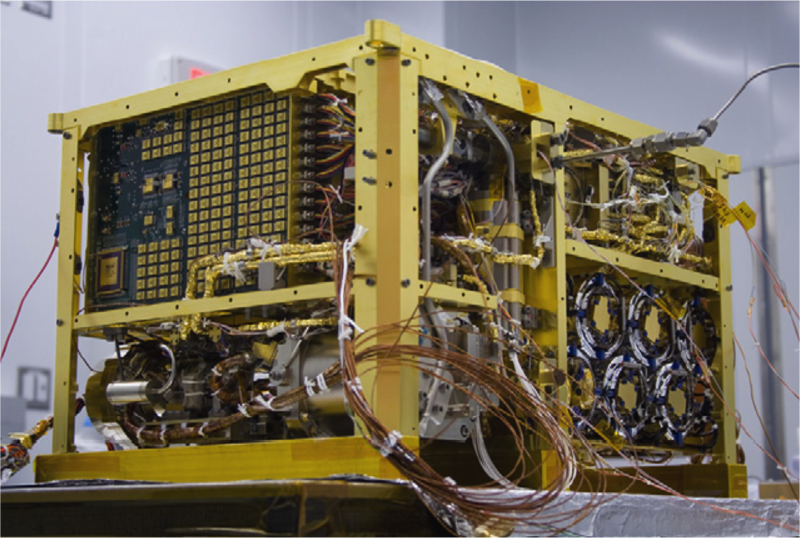 The SAM instrument suite includes a mass spectrometer that can measure carbonate abundances as low as tens of parts per million, and constrain carbonate chemistry via the temperature at which CO2 evolves upon heating. SAM's Tunable Laser Spectrometer can measure even lower abundances, potentially down to parts per billion, and for higher abundances can measure isotope ratios that may reflect alteration processes, atmospheric escape, volcanic outgassing, biology, or all of the above. We are currently participating in the analysis of early SAM data from Mars. 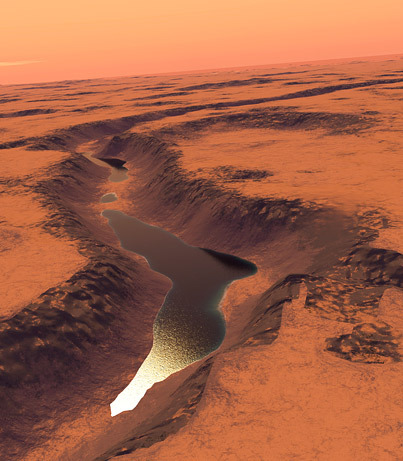 Numerous Martian craters appear to have once hosted lakes. The Spirit rover was sent to Gusev crater because a large valley emptied into it, suggesting water might once have ponded inside. Yet Spirit found no clear lake sediments, and for many years the orbital evidence for aqueous minerals in other putative paleolakes was also missing. CRISM is changing this story, with both clays and hydrated salts now being found within paleolakes such as Columbus crater. The video at right shows bright sulfate outcrops that we identified on the crater's northeastern floor and in a "bathtub ring" halfway up the crater wall. These salts transition from more to less hydrated varieties with increasing depth within the crater, and may have formed when a lake evaporated or froze. Columbus crater has no major inlet valleys, but is a location in which elevated groundwater upwelling and evaporation have been predicted. 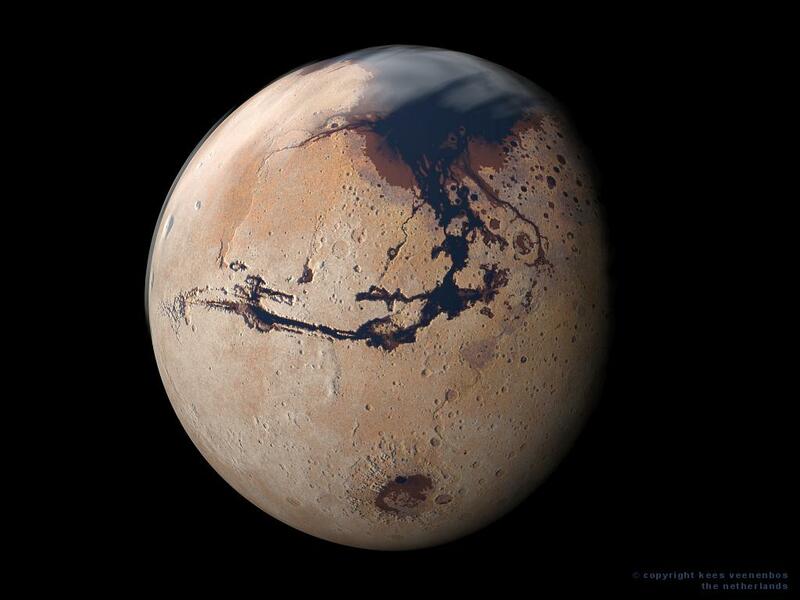 We suggest groundwater-fed lakes may represent a new class of habitable environment on ancient Mars. We have identified polyhydrated sulfate in another Martian paleolake in Shalbatana Vallis. However, yet another paleolake, in Jezero crater (near the Nili Fossae), instead contains carbonates along with Fe/Mg-smectite clays. This mineralogy implies a different chemistry from the sulfate-rich deposits found in Columbus and Shalbatana, but is it merely a result of erosion and transport of carbonate- and smectite-rich materials known to exist in Jezero's watershed? Or do these differing salt compositions reflect local differences in water chemistry, groundwater vs. meteoric inputs, or possibly a change in atmospheric composition over time? We are studying additional paleolakes with CRISM, attempting to narrow down these hypotheses by finding more candidate lake evaporites. Modern Mars is an active world. Several types of hillslope features have been observed to change via repeat spacecraft monitoring, fueling speculation on the role of liquid water in each case. Warm-season recurring slope lineae such as those at left are arguably the most consistent with flow of liquid brines. We are using CRISM to search for independent spectral confirmation of liquid water or salts in these flows, with only negative results so far. Additional monitoring and the use of "superresolution" observing methods may lead to further progress. Additional evidence for brine activity in recent Martian history comes from the morphology and chemistry of dust-mantled regions. We analyzed a thick dust mantle west of the Tharsis volcanoes in a study led by Suniti Karunatillake. 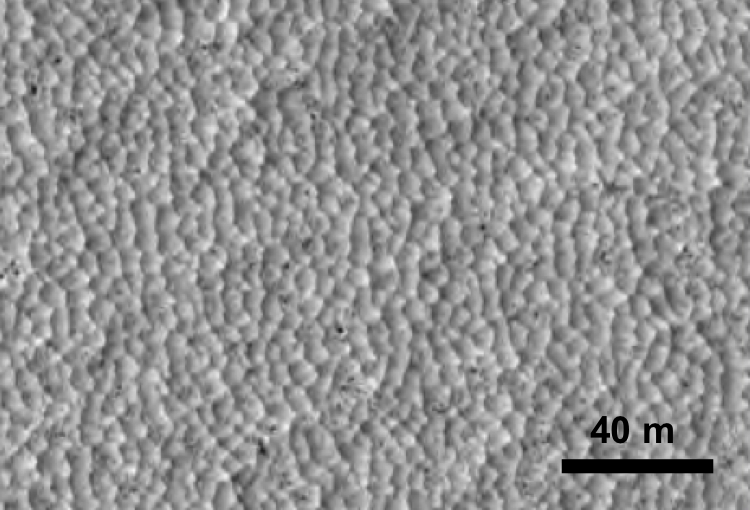 Like other dust mantles, it has a honeycomb-like texture with characteristic spacing ~5 meters. The dust maintains steep cliffs where penetrated by impact craters or other topography, implying cemented rather than loose dust. Remote chemical data suggest a sulfate cement. Intriguingly, older Hesperian outcrops with monohydrated sulfates (e.g., kieserite) have similar textures, suggesting that sulfate-cemented "duststone" may have formed over much of Martian history. Exploring these materials may help connect Mars' aqueous present to its past. One of the most provocative recent discoveries about Mars is the possible identification of methane in its atmosphere that appears to vary over space and time. 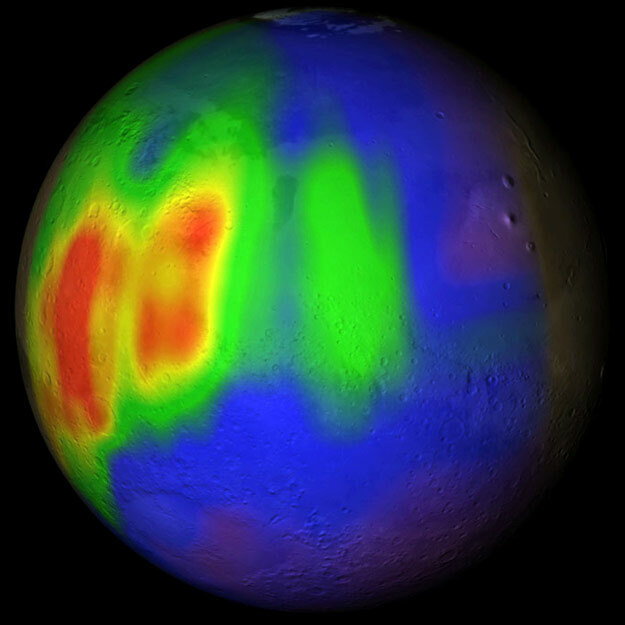 Methane is unstable on Mars, and would likely imply ongoing geologic or biological activity. If future ground- and space-based observations confirm discrete plumes of methane, then the geologic properties of plume regions should help to constrain their origin and release mechanisms. We have begun studying the geology of these regions with existing orbital imagers and spectrometers, and this will be a prime objective for the HiSCI camera launching in 2016 aboard the ExoMars Trace Gas Orbiter. HiSCI will acquire the best-ever color imaging of Mars from orbit, and Co-Investigator Wray will use these multispectral (4-color) images for rough mineral classification and mapping at scales of a few meters. Searching for liquid water in our solar system necessarily leads one to the icy satellites of the giant planets. Specifically, Jupiter's moon Europa shows several lines of evidence for a global liquid ocean beneath its frozen surface, and Saturn's Enceladus has jets of water vapor and ice bursting from warm surface cracks that might also indicate subsurface liquid. The chemistry of these water bodies is critical to their capacity for supporting (or not) potential life forms. We use current and future ground-based and space-based spectral instruments to constrain the surface and exospheric compositions of these worlds, focusing on salt chemistry and on the search for organic molecules.